I tend to think that the goal was to, at least as you pointed out in the european tradition, attain perfection. This is reflected in the title of roubo's book, "to make as perfectly as poaaible" form my experience it was often the case with country makers, whose skills and tools were lacking too. 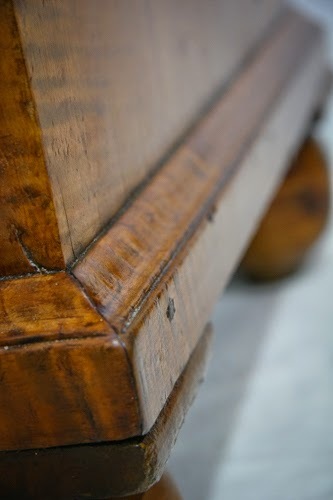 I have often seen attempts at elaborate ornamentation applied to a piece made by someone not as skilled as roubo and his contemporaries, however they still aspired to, and strove for that same goal. ....which does fly in the face of what seems to be currently in vogue with some 18th century woodworking re-enactors who do not just accept....but celebrate tear-out, out-of-square stock and joinery, rough surfaces, etc. Yes. Well... secondary surfaces were rough. Also, not all faces and edges needed to be exactly square. But yes, on show surfaces their objective was to make it as perfect as possible while still making a living.